Here come the summertime burns, cuts, bites and stings. I recently gave a lecture on Herbal First Aid covering these topics and more. Here are the notes for everyone who couldn’t make it. Activated charcoal– draws out and absorbs toxins. Open up capsules and mix contents with a small amount of water. Leave on bites for 15-30 minutes. Can also be taken internally for bites and gastrointestinal issues such as food poisoning. 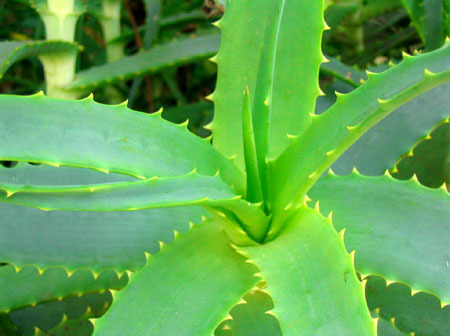 Aloe– general skin soother and healer, especially for burns. Apply topically to irritated skin or burns as often as needed. I mix a few drops of lavender oil into my aloe when using it for burns. Arnica– great for bruises, sprains, and pain from excess activity. Take arnica pellets orally and apply arnica gel, cream, or oil topically up to every 15 minutes for 2 hours, then up to 4 times a day. Black walnut– antifungal activity makes it a classic Ozarks cure for ringworm. Only use the green outer hulls of the black walnuts or the tincture made from them. Calendula cream or ointment- speeds healing of skin issues like irritation and minor scrapes and wounds. Often combined with comfrey and other healing herbs. Apply several times per day. Calendula can be also made into a tea to enhance lymphatic circulation for detoxification or immune support. Clay– draws out toxins and cooling to the skin. I mix up ¼ cup clay with ¼ cup water and apply thickly to bug bites, poison ivy, and minor burns (after the aloe and lavender). Leave on for 20 minutes to an hour, and then wash off. I store the extra mixed up clay in a tightly sealed container in the refrigerator for the next round of bug bites. Comfrey– soothes the skin and speeds healing of skin, sprains and broken bones. Used topically as a salve for wounds or a comfrey poultice for sprains and bones. Not recommended for use on deep wounds, because it can cause the skin to heal before the underlying tissues do. Drawing salve– homeopathic blend for boils and bites. Some people love it for acne too. Ozonated olive oil– speeds healing of minor wounds, rashes, burns, and bug bites. Apply topically several times a day. I find that ozonated olive oil neutralizes itchy chigger bites better than anything else for me. For minor sunburns, I apply it to after using aloe. Plantain leaves– grind up the leaves for a quick poultice for bug bites, stings and cuts. Potato Poultice– for skin infections. Finely grated potato and apply to thickly to infected area. Leave on for 30-60 minutes or overnight. Can add minced garlic and parsley to boost antimicrobial benefits. Rescue Remedy– calming for stressful situations and shocks. It can help that shaken up feeling after an injury. Tea tree oil– antimicrobial for bites and minor wounds. I mix a few drops into my herbal salve to boost the antimicrobial benefits. Soak a cloth in a liquid herbal preparation such as a tea, diluted tincture or an oil, wringing it out well, then placing over the body. They are usually applied warm but can also be used cold in cases of swelling or inflammation. Leave in place for about 10 minutes and sometimes repeated with fresh liquid several times. For ease, they can be wrapped in cling film to keep in place and avoid staining clothe or furniture. In cases where a deeply warming action is needed, a towel and a hot water bottle can then be placed on top. Grind dried or fresh herbs with water and a little slippery elm powder or flour to create a paste. Spread the poultices on cotton rags and folded them into squares. Apply to skin and wrap it in bandages to hold it in place. Any remaining squares can be put in a ziploc bag with parchment paper in between and frozen to use in the days following. Or mix powdered herbs with an equal part slippery elm powder, then add a little warm water and honey and mix into a thick paste. Spread it over the area in question and bandage in place. This entry was posted in Herbs and tagged bug bites, Calendula cream, infections, lavender oil, minor wounds, poultice, stings, sunburn. Bookmark the permalink.